The Genera HD yeilds an aggressive rimshot and balanced response. 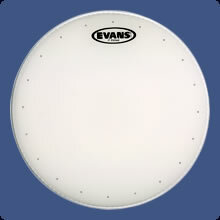 This durable two-ply head (7.5mil external, 5mil internal) with 2mil overtone control ring barks live, yet is ideal for the studio. Additional dry vents eliminate stray harmonics.